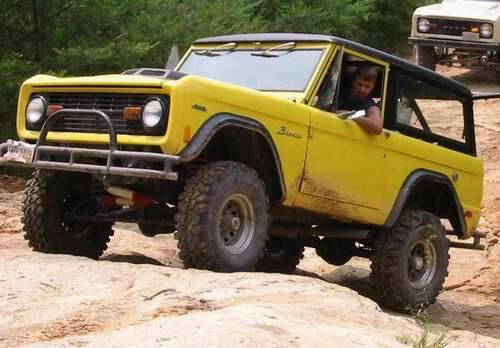 Glenmont, BroncOhio My bronco is a 74 body/69 chassis, it has a dana 44 front-end, Np435 transmission, with a 205 transfer case, a 96' 302 ford block with a summit racing 347 stroker crank, stage 2 connecting rods, Keith black 10:1 pistons, sealed power rings, comp cams offroad extreme cam with 225 dur, crane high energy roller rockers, melling hv oil pump, weiand stealth intake, world products "Windsor" heads, edelbrock 650 cfm carb, msd 6t ignition, Mallory unilite distributor, powermaster 140 amp alternator, 4.5" lift with 3" body lift. I've installed power steering, power brakes, and rebuilt the 44 with brute force axleshaft joints and converted to disk brakes. I also had driveshafts from a full size bronco shortened to fit. My tires are Super Swamper 34x10.50 TSL's. This has been a ground up restoration with the sole purpose being 4x4'n. Future mods include a winch, lockers, 4.11 gears, and fuel injection.